The City of Lakewood has installed several transportation pilot projects that test street improvements with paint and temporary installations before permanent improvements are constructed. This method allows data to be collected before and after the installation to ensure the concept is appropriate and adjustments can be made. These projects aim to address the mobility goals in our Community Vision. The Detroit-Sloane intersection improvements were installed in 2018 to pilot a reduction in intersection width, making the intersection safer for pedestrians accessing the Rocky River Reservation. At a public meeting about the intersection in 2017, the City of Lakewood handed out a survey for the Detroit/Sloane/Valley Parkway intersection that asked attendees their comfort level accessing the Metroparks from this intersection. This survey assessed their comfort on a scale of 1 (would not attempt) to 5 (confident) in driving, walking, and biking the intersection alone, and then walking and biking the intersection with kids. These surveys revealed that while nearly every survey responder felt confident driving through the intersection, giving it an average score of 4.36 out of 5, the average score for walking/running the intersection was significantly lower at 2.85, and even lower for comfortability biking with an average score of 2.56. These scores are between the categories of “scared but willing,” and “cautious.” The results were even lower when attendees were asked if they would walk or bike with children. A traffic study was completed to determine how the pedestrian experience could be improved at the intersection. The study is available here. This project also included a public art piece on the northeast corner of the site. The public art, titled “Reclaimed” was done by local artists Manka + Evans. This project is about much more than signage or bike parking. It’s a statement. This project is about celebrating a vibrant community and its commitment to active, healthy living. It’s about reclamation. More often than not, the first sign of new life in any stressed environment is grass. While simple and humble, this grass signals a transformation. It’s a sign of nature reclaiming what came before. 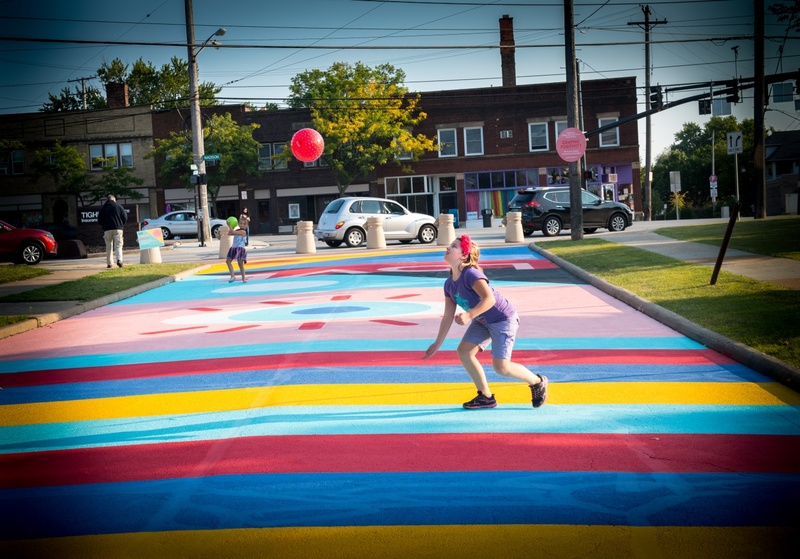 “Reclaimed” will amplify that idea: a simple yet bold and powerful form will celebrate the community’s commitment to placing the importance of parks and public spaces and the people that use them on par with cars and trucks. It will announce entry into a progressive city and build off not only Lakewood’s collection of amazing parks but also the adjacent Cleveland Metroparks. 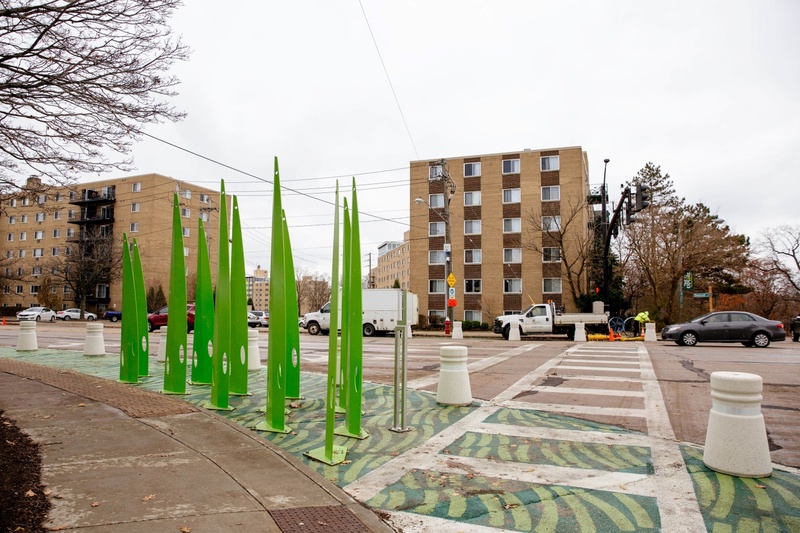 Historic Signage, planters and a bike repair station will be installed in Spring of 2019. The conceptual plans for Wagar Park in 2016 considered closing the southern portion of Rosewood Avenue to expand park space and solve a dangerous intersection. In 2017, the street was closed with bollards and a mural was painted to test the street closure before the final construction documents were created and construction started. A traffic study was done for Clifton Blvd Extension and determined that the two lanes in either direction were not necessary for the traffic volumes. In order to accomplish the goal of reconnection the neighborhood and reducing speeds of vehicles, the roadway was reduced to one lane in either direction. With the excess road area, the city was able to install protected bike lanes. Residents were concerned about speeds of vehicles down Woodward Avenue. 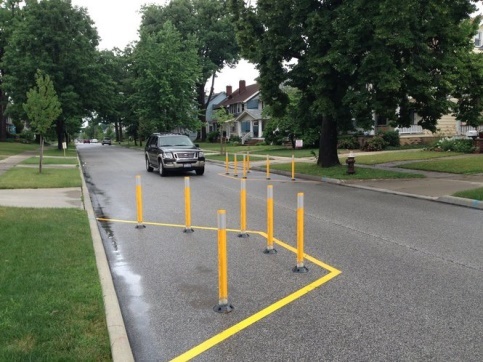 The city tested the installation of chicanes using paint and bollards and data showed the installation was successful in lowering speeds. Permanent chicanes with green infrastructure that absorbs stormwater were installed in 2017.